The Prowl is fun for everyone! Established in 2007, our Panther Prowl Walk-A-Thon is a record-setting success year after year! Tired of years of wrapping paper and pizza fundraisers with few results, PSO Board member, Lisa Ashmus, began researching new ways to boost organization revenue. 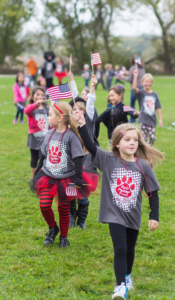 Paris School’s Panther Prowl Walk-a-Thon made its debut that year and raised $10,000–greatly exceeding all expectations! As families and friends gather to cheer on our walkers each October, we are thankful and proud that Paris School is part of a generous and caring community that believes in and supports K-8 education! We thank our Panther Prowl sponsors for providing event t-shirts for our Prowl participants each year and for ensuring that 100% of Prowl proceeds directly benefit our kids and classrooms! Panther Prowl season wraps up with a celebration assembly featuring our grand total reveal, prize announcements, and students covering staff volunteers with Silly String and shaving cream pies! Panther Prowl 2018 proceeds total: $37,160!